Nice picture by Kazik/Anadune from the demo "The Sunrise"
Today we’re going to have a look at a demo called The Sunrise. It was made by a Polish group called Anadune back in 1996 and released at the Polish Summer Party in Poznan the same year. The demo took the second place in the Amiga competition, only beaten by Utmost Vacancy from Scum. As a side-note, the Polish Summer Party in 1996 was the first multi-platform party to be arranged in Poland. The organizers, Flying Cows Inc., could report that over 200 people took part in the event. Anadune is a well-known group on the Scene. They’ve been active since 1994 and have released many demos, intros and slide shows. 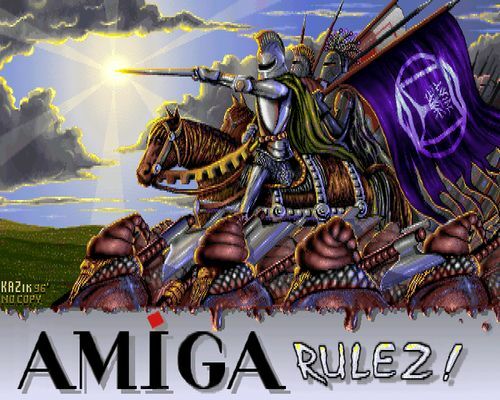 Originally an Amiga group, they converted to the PC after 1999. Their latest demo is called Crush and was released at the Breakpoint party in Germany in 2009. Famous members includes people like Mr. Acryl (programmer), Lazur (graphician), Kazik (graphician), Revisq (musician), Action (swapper), QBA (swapper) and Norman (swapper). To run The Sunrise, you’ll need an AGA machine (Amiga 1200/4000), some Fast-RAM and a hard drive. The first part of the demo is very atmospheric. It starts off with a poem by an author named Ilya Kabakov and then moves on to some impressing animations. These sequences show a man walking towards a castle, entering the gate and then arriving at his destination, which is the tree of Anadune (I instantly thought of the White Tree of Gondor when I saw it.. it’s very nicely drawn). The first part of the intro. 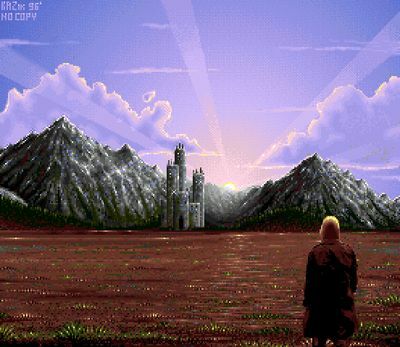 This is a screenshot of a man walking towards a castle (screenshot by Old School Game Blog). Another screenshot from the intro. 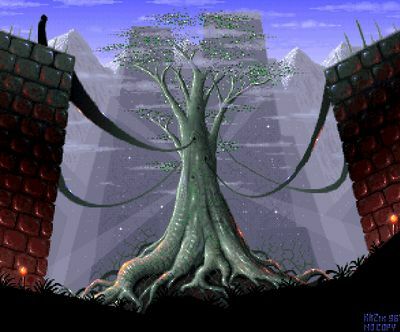 Here you can see the tree I was writing about above (screenshot by Old School Game Blog). The graphicians have done a tremendous job in this production, no doubt about that. This includes the textures used for the effects, the backgrounds, the animations and so forth. Everything is detailed and well made. 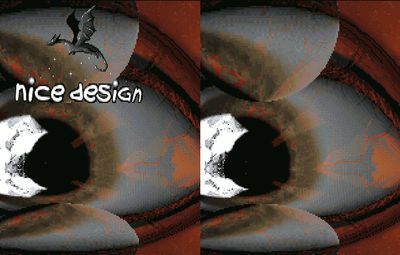 The end of the demo features a scroller with a cover of a song by Enya playing in the background. We’ve now had a look at the graphical aspects of the demo, but what about the music? Personally I think the main theme is all right and that it goes well with what is on-screen. It’s not a song that will stick to your brain though, but decent enough. I enjoyed watching The Sunrise and found the demo quite entertaining. 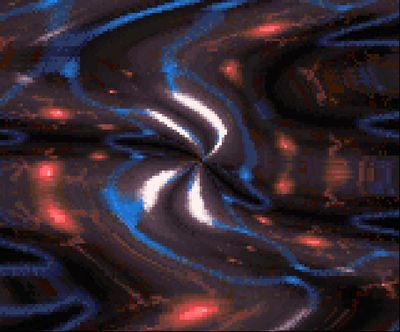 The effects are OK, but not the most advanced seen in 1996, especially if compared to Tint from The Black Lotus and The Gate from Artwork. The big wow-factor in this production is definitely the graphics. The pictures, textures and animations are truly impressive and nice to look at. I can guarantee that I’ll watch this demo again due to this, since it was awesome stuff. 🙂 The music was not gobsmacking, but worked well enough with what was shown on the screen. All in all, The Sunrise is a good demo. It’s entertaining to watch and it has a certain “I’ll watch it again”-factor. 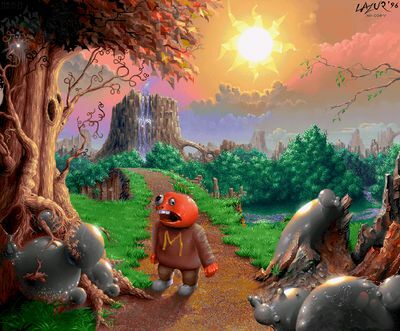 Old School Game Blog gives Anadune and The Sunrise a thumbs up! Thanks for reading folks and please leave a comment below of what you think of the demo. Thanks in advance. 🙂 Hope to hear from you! The medieval images look pretty cool. I agree. 🙂 The graphicians contributing to this demo were incredibly skilled. I agree with you that it has a I will watch it again factor. Great write up. Good to hear that your Amiga 1200 is busy unpacking the .LHA archive. 🙂 What kind of card do you have in your Amiga 1200 by the way? Is it a 4MB Fast-RAM board? Yes it is. But it crashes my Amiga after some time. 😦 I got one fitted now that has 8MB of memory and still running. But I got the feeling it will also crash. Hope you’ll get the problems sorted out. It’s sad that the card is not working properly. 😦 Have you tried adjusting the jumpers? I will have a look at the jumpers (actually not sure if they are there). Looking forward to hear how it went with the memory card. 🙂 Good luck! Many thanks for visiting my blog and for commenting. 🙂 It’s been a long time since I last saw Yon, but will have a look at it again. I remember it having quite a lot of interesting graphics.